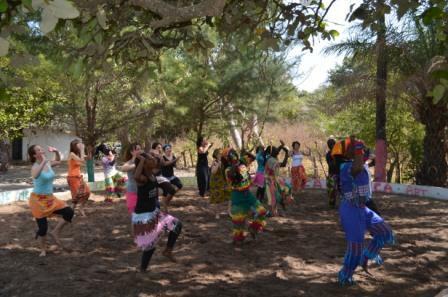 Dancing & Drumming: Caro teaches 2x daily 2h for beginners and advanced people in the sand arena o on the beach. 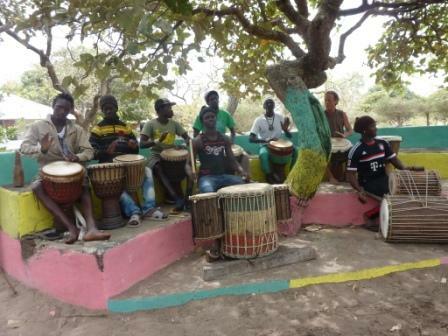 Drummers of BLACK SOOFA teach 2x daily on Djembe oder Doundoun. 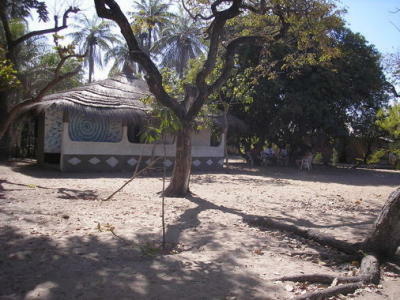 Campement in Abene: The workshop will take place in a cosy and peaceful camp in Abene, a small village in the Casamance region in the south of Senegal. Just a five minute walk from a spectacular beach, guests live in attractive huts with wall paintings. African cooks prepare delicious meals. Excursions: Various excursions can be arranged: visits to villages, markets, festivals, carnival events, music and dance spectacles, concerts; trips in dug-outs or canoes to mangrove swamps or bird islands. A highlight is the Sabar Festival in Ziguinchor, a cheerful cultural event. Stay as long as you like. Usually no lessons on Saturday afternoon and Sunday. Flights: Flights to Dakar and intercontinental flight to Ziguinchor or flights to Banjul (Gambia). Journey form the airport or stay overnight in Dakar can be arranged.